Airlie Beach is situated on the coastline between Mackay and Townsville and offers the perfect location to explore the magical Whitsunday's from. Venture out on a yacht to the outer Great Barrier Reef, go snorkeling, coral viewing or fishing. Head into the rainforest for walks or visit the wildlife park. Visit the markets on Saturday mornings along the Airlie Beach esplanade. Take a scenic flight and see everything from the air! There is a large variety of restaurants and shopping facilities and the many pubs, clubs and bars provide a buzzing nightlife. Overnight crewed sailing trips through the islands, and the largest Bareboat Charter Fleet in the world also operate from here giving you the chance to skipper your own boat. Airlie Beach is drenched in sunshine, has warm seas, cool sea breezes and an enviable warm climate all year round, the weather in Tropical North Queensland is incomperable to most other Australian cities. The Airlie Beach region has two weather seasons; a winter period of rather warm temperatures and minimal rainfall, and a summer period of warm balmy temperatures and higher levels of rainfall. 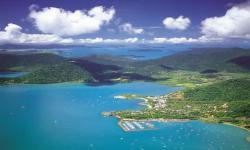 The swimming in Airlie Beach is fantastic all year round. However the 'traditional' swimming season runs between April and October because between November and March Tropical North Queensland is home to the deadly box jellyfish. During this time swimming enclosures are erected at popular beaches to ensure that swimmers are protected. The ocean temperatures range from a warm 23 degrees C in July to an even warmer 29 degrees C in February.